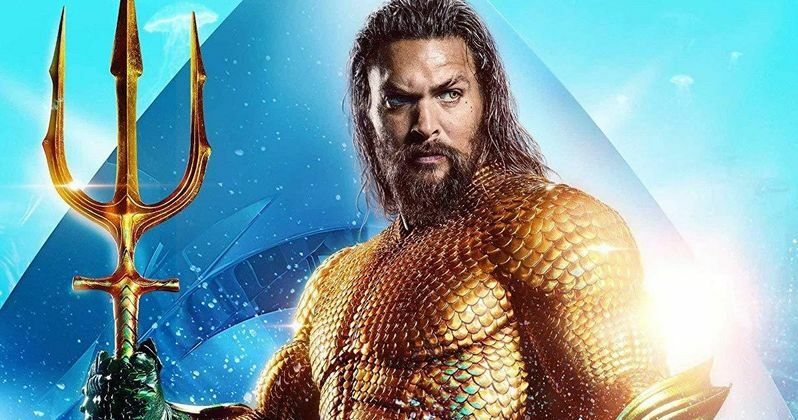 Batman News has revealed that Aquaman, which recently became the highest-grossing DC movie ever, will get a Blu-ray release in March. Despite fans' weariness of Aquaman prior to its theatrical release, the film blew all expectations out of the water. Aquaman's massive box office gross was complemented by generally favorable reviews from critics and audiences alike. And unsurprisingly, the underwater superhero movie will surely make make waves once more when it hits the home market. Until its release back in December, the Atlantis-based superhero was mostly seen as a laughable character when compared to other mighty DC icons like Superman and Batman. And to make matters worse the idea of giving the character his own solo movie was met with even more hesitation. But somehow director James Wan and star Jason Mamoa produced a wildly fun blockbuster that has helped the DC Extended Universe to stay afloat. The success of the film has, of course, persuaded Warner Bros. to green-light a sequel that's now already in development. Created all the way back in 1941, it seems like Aquaman/Arthur Curry is finally getting the recognition and popularity that he deserves. According to Batman News, Aquaman is set to hit 4K, Blu-ray and DVD on March 26th. For fans who don't wish to wait that long can purchase the digital copy two weeks earlier on March 5th. To sweeten the pot even more, the Blu-ray will include twelve featurettes, with titles like "Going Deep Into the World of Aquaman" and "Creating Undersea Creatures," so there will definitely be some interesting behind-the-scenes looks at the film. The report also revealed that the Blu-ray will feature a sneak-peek at DC's upcoming Shazam! If of all that doesn't entice you, then probably nothing will. Sadly it may be a while before fans can get their hands on Aquaman 2. However there's still no shortage of great upcoming DC installments. Coming soon are highly-anticipated films such as Joker, Birds of Prey (and the Fantabulous Emancipation of One Harley Quinn), Wonder Woman 1984, The Batman, and the aforementioned Shazam! Confidence in developing many of these sequels and spinoffs has more than likely been helped out by the success of Aquaman. Unlike a number of prior DC installments like Batman v Superman: Dawn of Justice, Suicide Squad and Justice League, Aquaman was able to perform very well on all fronts. It's quite possible diehard fans will be willing to spend the few extra bucks to pick up Aquaman on 4K. Despite the film being snubbed at the Oscars for its stunning visual effects, there's no doubt that Aquaman will still look incredible in that format. It will also be interesting to see just how Wan managed to pull off the feat of setting a superhero movie almost entirely underwater. That's no easy task. Aquaman will be available for purchase digitally on March 5th followed by 4K, Blu-ray and DVD on March 26th. This news comes from Batman News.